The practice of child marriage is a violation of human rights. Every day, girls around the world are forced to leave their families, marry against their will, endure sexual and physical abuse, and bear children while still in childhood themselves. This practice is driven by poverty, deeply embedded cultural traditions, and pervasive discrimination against girls. Yet in many parts of the world, this ancient practice still flourishes: estimates show that nearly five million girls are married under the age of fifteen every year, and some are as young as eight or nine years old. 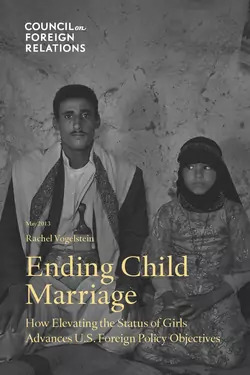 Child marriage, however, is not simply a human rights violation. It is also a threat to the prosperity and stability of the countries in which it is prevalent and undermines U.S. development and foreign policy priorities. Child marriage perpetuates poverty over generations and is linked to poor health, curtailed education, violence, instability, and disregard for the rule of law. Its effects are harmful not only to girls, but also to families, communities, and economies—and to U.S. interests—around the globe. Professors: To request an exam copy, contact Ashley Bregman at abregman@cfr.org. Please include your university and course name.